First impressions matter and therefore the reception area should market well your organization. It thus goes without saying that the decision to get a reception desk should take enough time and research given the fact that this is a huge purchase for any business. There are literally dozens of desk options, sizes, styles, and materials to consider when making your purchase. Unlike other desks that only serve as working platforms, the reception desk does more. It is not only used for work but it also serves as the face of the company. This is the place where customers and clients see when they enter your business premises. It therefore makes an impression on your clients and customers since this is where they interact with your employees. You should use your reception desk to portray professionalism, uniqueness, and success. Ensure the reception exhibits a business that clients would love to do business with. The nature of the business you engage in will affect the style, material, and function of the reception chosen. This is ideally due to the fact that businesses have unique requirements based on the kind of picture it is intended to create. For instance, a reception within a home office does not have to be high end as that within a lawyer’s office. You therefore need to understand the functions which the desk will perform before you buy one. This will substantially minimize any future problems. Space will affect the kind of desk you can have in your business. If you have a tiny office then it will be impossible to have a large reception desk since it will take up all your working space. On the flipside, a tiny reception desk within a spacious room will not be appealing. Therefore, you need to have all your measurements before placing an order so as to ensure you get a balanced look. It is very important to consider the kind of functions the reception desk will perform otherwise it will not be necessary to have it. Some of the functions to consider include; will it be a place for storing files, exchanging money, making and receiving calls, signing documents, and many others. Once you understand the functions the desk will perform, you will be able to choose the right one. Every business has its unique style and décor and therefore these are important considerations when purchasing a reception desk. Some of the styles to choose include; modern, classic, or a tailored style. You can also choose to incorporate your brand on the desk design. A reception desk that blends with your office’s overall design will be more appealing. 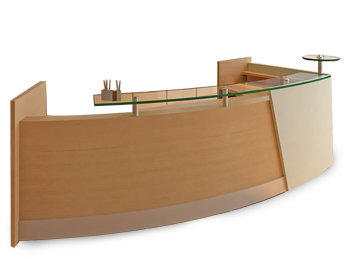 A curved reception desk will appeal to your clients. They are normally curved outwards and are the most popular. It is a modern shape design used mostly in lobbies, salons, offices, and spas. Due to its unique design, most people think it is expensive to setup such a desk. Fortunately, they are quite affordable when compared to other types of reception desks. The U-shaped reception desk is quite accommodative. It is a unique design that provides 3 work spaces for your reception staff. It is popular in businesses that have spacious waiting rooms and receptions. Their prices vary widely depending on the materials used to make the desk. These stylish reception desks are popular with salons, businesses, and spas. They usually portray an elegant and modern appearance. They have sleek lines and are known for their simplicity. These desks may be tailored into some shapes such as Curved, U, or any other shape. They are characterized by high gloss finishes, glass panels, and diverse colored counters. They also use wooden and metallic materials. Some of the other popular designs of modern reception desks in the market include; white reception desks, black reception desks, and L-shaped reception desks. Metal-this is used in most furniture applications including reception desks. Stainless steel in particular is the most preferred due to its sleek and modern look. It also blends perfectly with furniture. Metallic material is strong and can last for years to come. One weakness with metal is that it is difficult to reverse or cover dents and scratches resulting from damage. Laminate-this material is highly durable and affordable. It is normally used in making desks for areas where there is high traffic. It is usually similar to wood and is quite appealing. Solid wood-wood is an extremely popular material with regard to office furniture. It is normally combined with veneers. Desks made of solid wood are heavier and last longer. They are always appealing and worth every penny. Other materials-other materials that may be used in addition to the above include; stone, leather, glass, and even cement. Any of these materials can be used on the face, counter, or the sides of the desk. There are few options when it comes to buying a reception desk since it is a huge investment to any business. First off, you can check out your local Newspaper for businesses in liquidation. Pre-used desks may save money but you also have to ensure you buy what will match with your décor. Secondly, you can get great deals at local furniture stores. 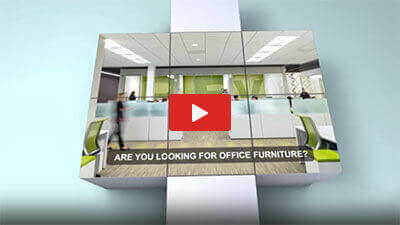 Finally, you can search online for tailored reception desks. The goodness with online stores is that you will get unlimited options to choose from both locally and internationally. An ideal reception desk should meet your needs and space requirements. It should be appealing to your clients and customers and should also act as your brand ambassador. You should choose a reception desk that blends perfectly with your office’s interior décor and leaves a lasting impact.